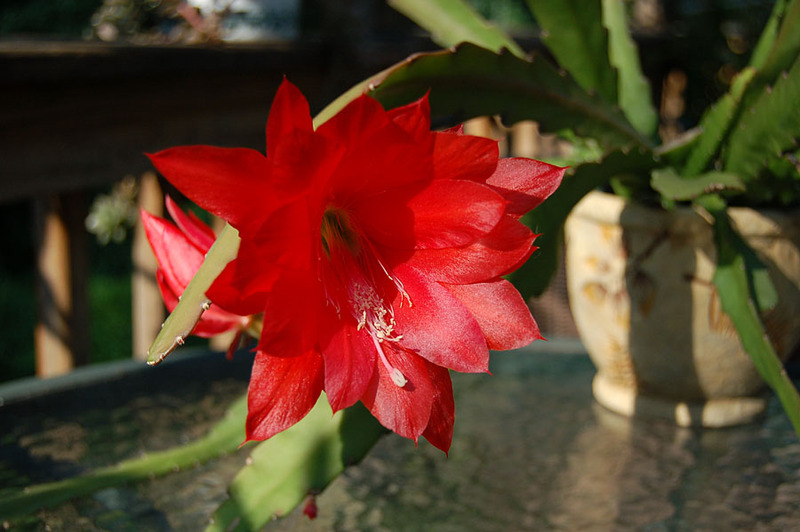 I keep this Epiphyllum from about October to the middle of April in an unheated sunny room, watering just enough to keep the pads from shriveling ( twice is usually sufficient). Then, after danger of frost, the plants are moved into a protected spot outside, slightly shaded, so they don't get burned. At this point, the flowerbuds are forming for the upcoming season. They take at least six weeks to mature and then start up with an explosion of color, some time after Memorial Day. At that point the heavy pots get placed right and left of our house entrance, where the mass of red flowers is much enjoyed. The house entrance is facing south, these plants don't seem to object to the bright light conditions during summer. They are heavy feeders and take a lot of water during hot weather. 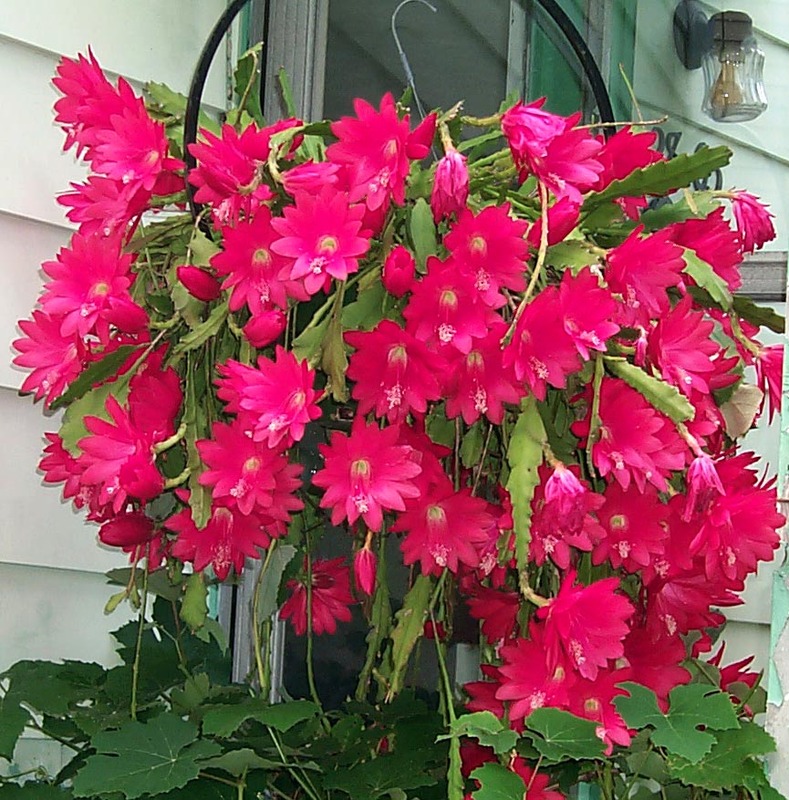 In 1984 he was visiting his wife's grandfather in Kentucky, where he spotted this beautiful Epiphyllum in full bloom on the porch. 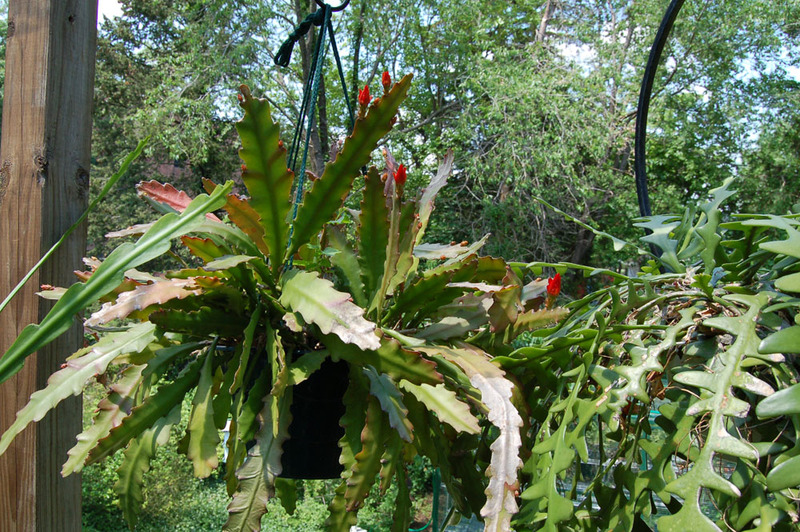 He took home some cuttings and began to propagate the plant commercially at his nursery in Ephrata. He never did any of the hybridization, but simply named the plant Jefferson Davis since his wife belonged to the family of Jefferson Davis. So either name - TJ or FD - does not give any clue to the history of this hybrid. I suspected for a long time that my pretty Epi JD might be D. ackermannii or perhaps the hybrid Ackermanni. Now thanks to the experts at Epiforums.com I can finally call this beautiful plant by its correct name. (Nopalxochia (or Disocactus) phyllanthoides (Deutsche Kaiserin) X Heliocereus (Disocactus) speciosus. 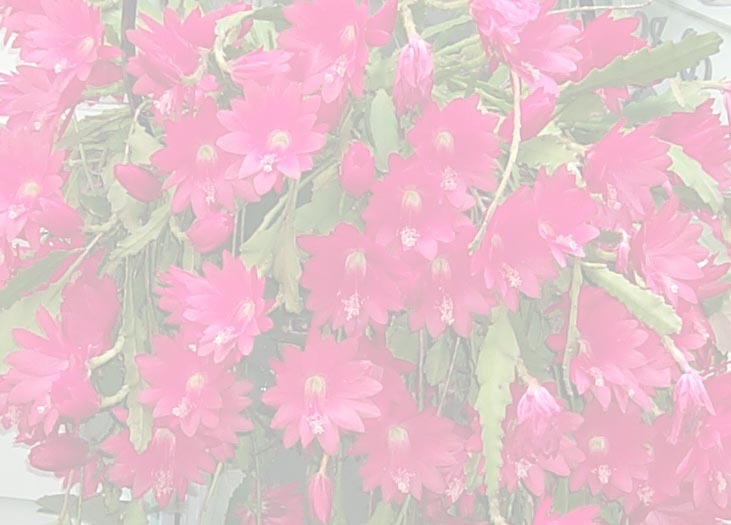 The flowers on my plant do not have all of the characteristics of the species Disocactus ackermannii ( stems never 3-angled, flowers not campanulate, stigma lobes purple red), or all of those of the hybrid. The flowers open fairly flat and I have never seen triangular growth, but since the stigma lobes are white, the species is ruled out. 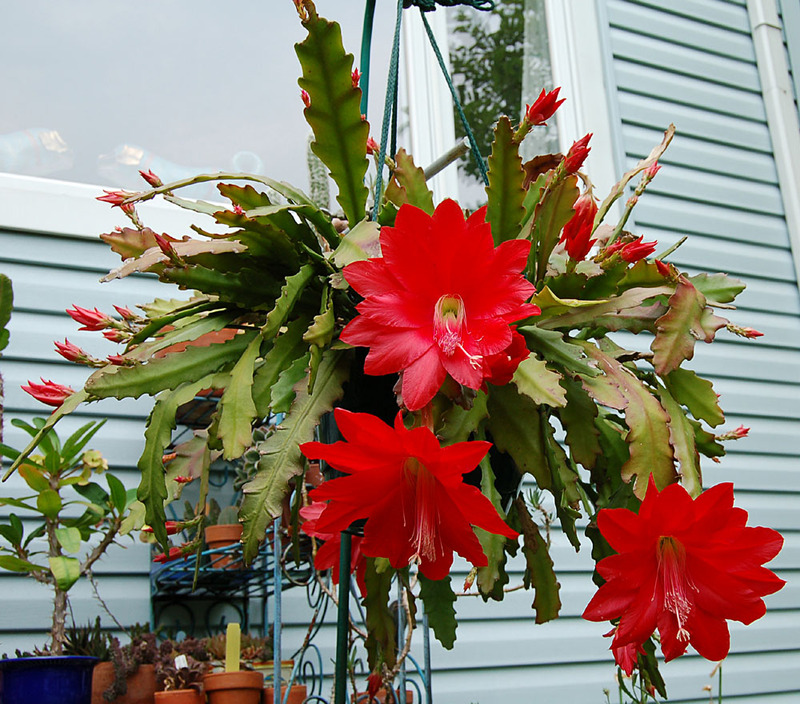 Here is a picture of this year's flowers, which measure six inches when fully open. I also had bought last Spring a small Epi noid, which flowered this year. 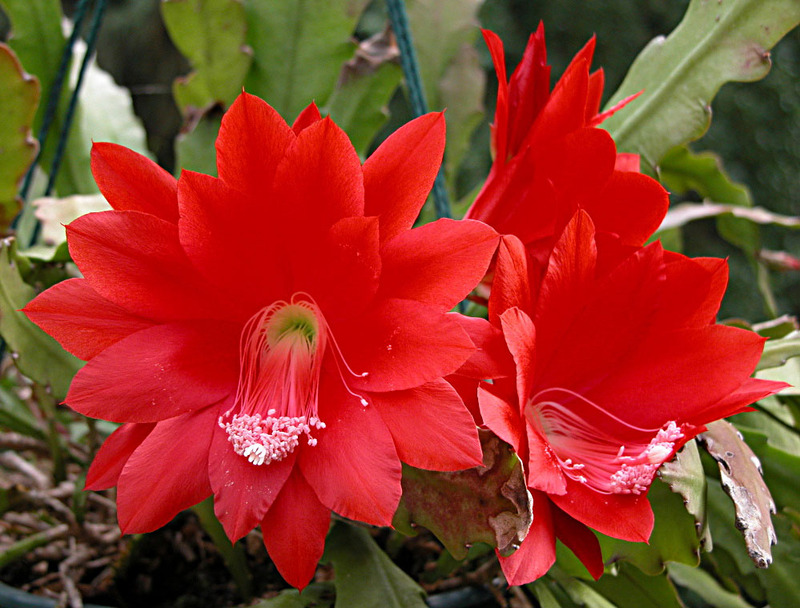 This one has triangular and flat growth, the flowers open somewhat bell-haped and measure only 4 inches. 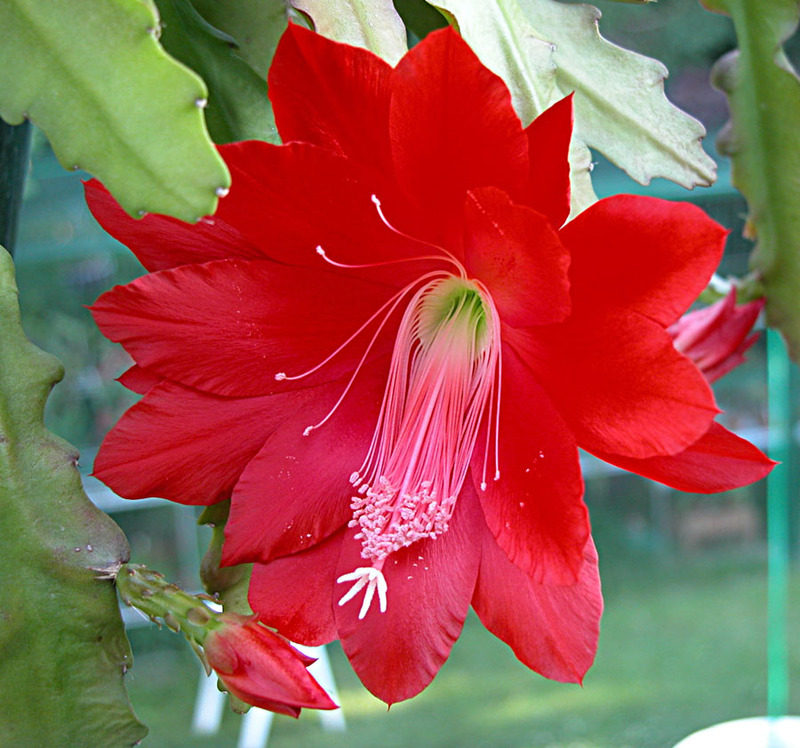 Here is the comparison: plant and flowers, it is surely also the Ackermannii hybrid. The definitions were copied from Epiforum.com thread "Disocactus Ackermannii" and Wikipedia. Since I had run out of room in the house to hold these large plants during the indoor season, I started to keep the Epi hybrids during the Winter in our unheated garage. A well insulated garage door was installed two years ago. The temperature in there never goes below 40 degr. F. A row of small windows provides very little light, the plants quit growing. Every few weeks I gave them just a tiny bit of water to prevent them from drying out too much, not more than three times perhaps. 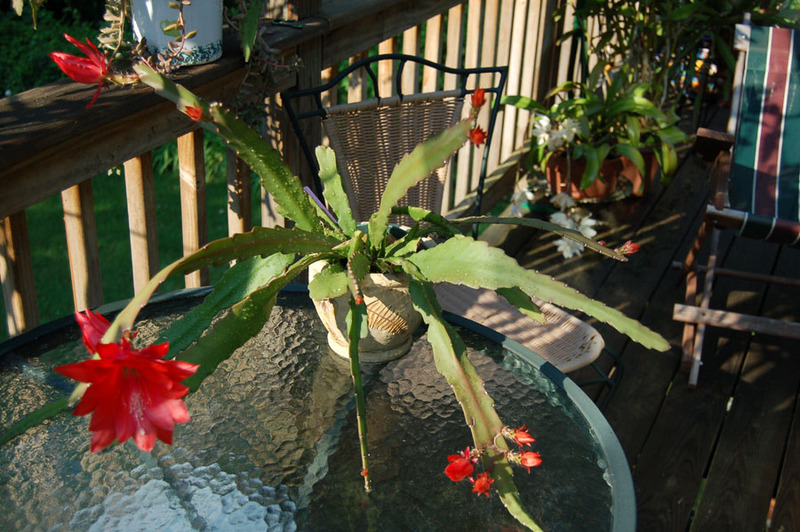 In early April I moved them on to the deck, watching out for night frost. The all came through very well and started budding.